Click on the term you would like to learn about. The backing material is the fabric that you see on the back of a quilt. There are many quality levels available for quilters to choose from. 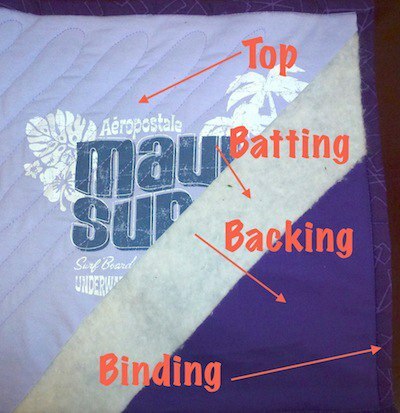 Batting is the "stuffing" that is in the middle of a quilt. Typically for a T-shirt quilt, this is a thin or "low loft" batting that is a little over 1/8" thick. T-shirt material is heavy to begin with, so a thicker batting would make the quilt even heavier. The binding is a piece of material that is sewn around the entire outside edge of a quilt, finishing the raw edges of the quilt. You will see only about ½" of the binding from the front and back of a quilt. 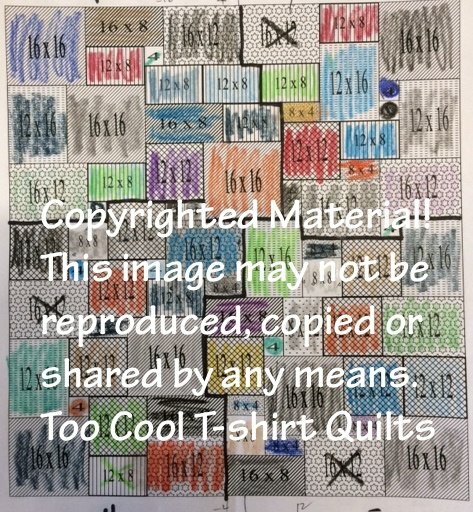 Solid colored blocks of T-shirt material used to add size to your T-shirt quilt. 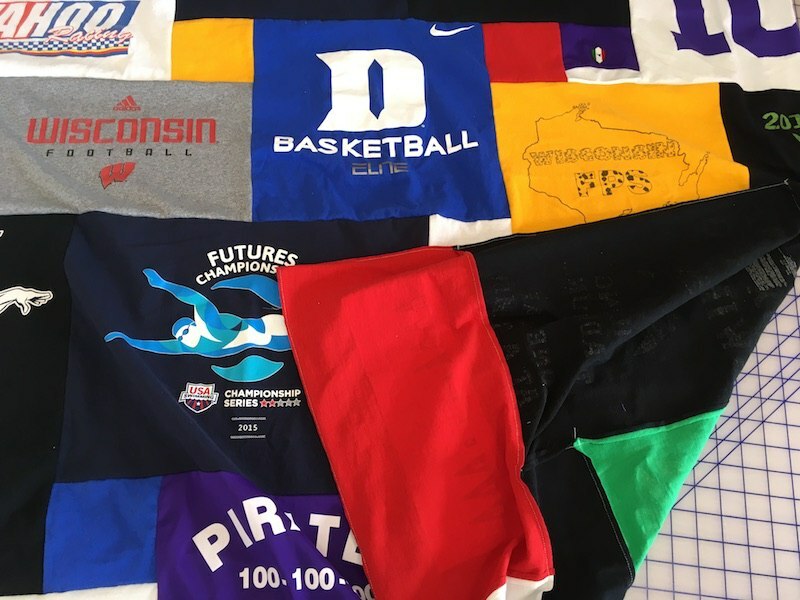 If a T-shirt quilt is smaller than anticipated, blank blocks can be added in to reach a desired size. 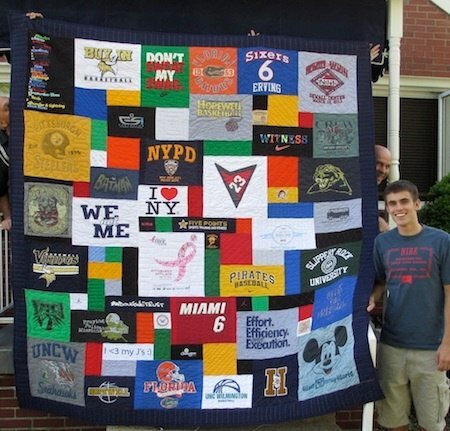 The front of a T-shirt blanket is made up of T-shirt blocks pieced together. But the piecing of the blocks for the blanket does not make it a quilt. 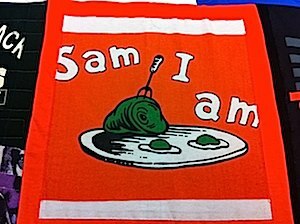 A T-shirt blanket is made up of just two layer – the top is the pieced T-shirt blocks and the back is typically a fleece of other heavier fabric. The two layers of a blanket are not typically connected to each other. 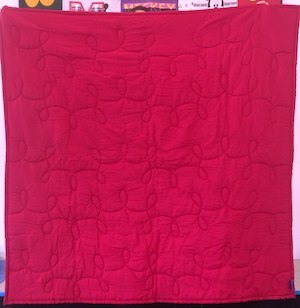 A quilt differs from a blanket because a quilt has three layers that are all connected with quilting. If a T-shirt is pre-cut, we must repair the block to fit our block system. This may mean cutting the piece smaller or sewing it to a bigger piece of material. A border is a frame that goes around the entire quilt top. The border is actually part of the quilt top and is made up of T-shirt material. 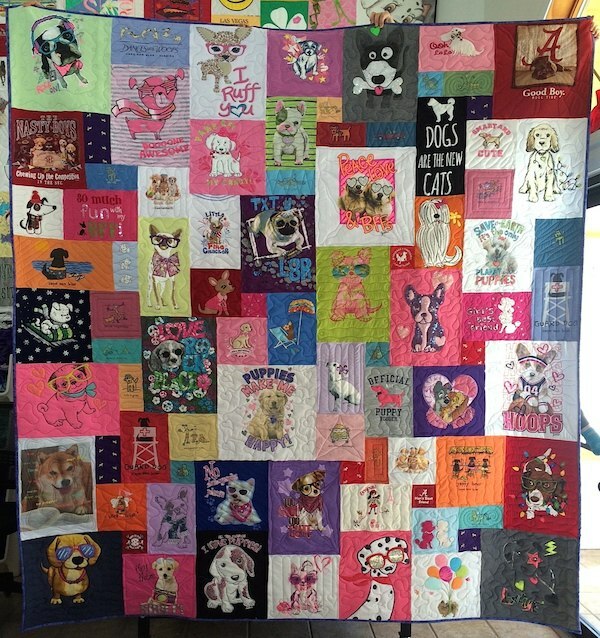 A quilt does not have to have a border, but it can add size, color, and style to any quilt. 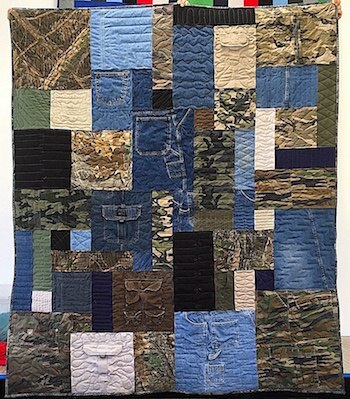 A quilt made with items other than T-shirts: patches, shorts, bandanas, socks...you name it. A baby clothes quilt is our most popular version. Like a neckline, this is the part of the garment that encircles the neck; normally there is extra material to be raised or folded over (like a business shirt, for example). All the designs on the T-shirts are cut out willy-nilly. The blocks are then glued to one piece of fabric or bed sheet. The blocks are then zigzagged down. Extra pieces of T-shirt material added in when the math doesn't quite add up. Usually in small numbers, fillers are simply used to complete the blank space in your quilt. 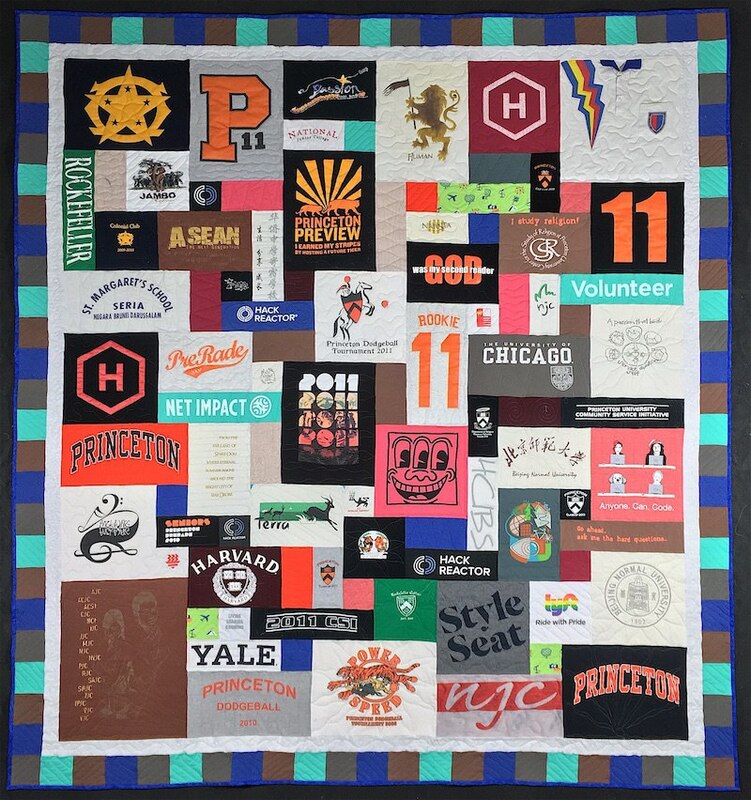 A graduation quilt is scrapbook of T-shirts that have been collected through the course of a student's schooling and showcased in a T-shirt quilt. 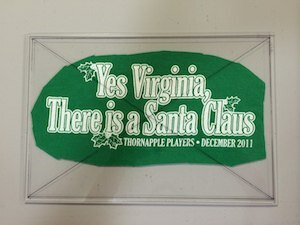 These make great gifts and displays at open houses. 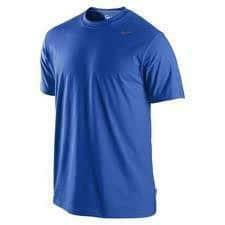 Part of an athletic uniform that is synthetic or mesh material. Baseball, hockey, football, basketball, and many other sports use mesh in part of the their uniforms. 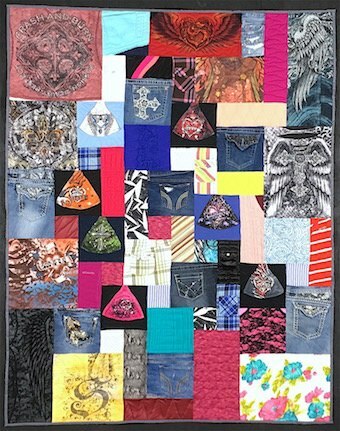 For a T-shirt quilt made from many different size and shape blocks involves puzzling together the different pieces into a quilt map. A long-arm quilting machine is the tool used to sew all three layers of a quilt together. They can be guided by a computer or by hand. Long-arm quilting is the process used to bind the three layers of a quilt. A long-arm quilting machine can be operated from the front or back of the machine. The process can be controlled by a person or by a computer. Once your T-shirts have arrived and been cut out, a layout is created; this layout is called the map. The sewer uses the map to piece together the T-shirts into a quilt. 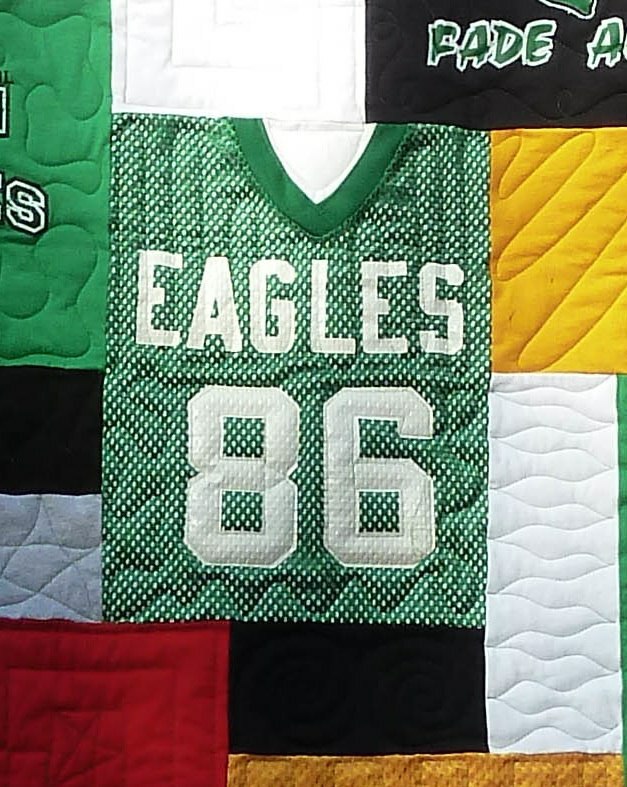 A quilt that is made from a passed loved one's T-shirts or clothing. 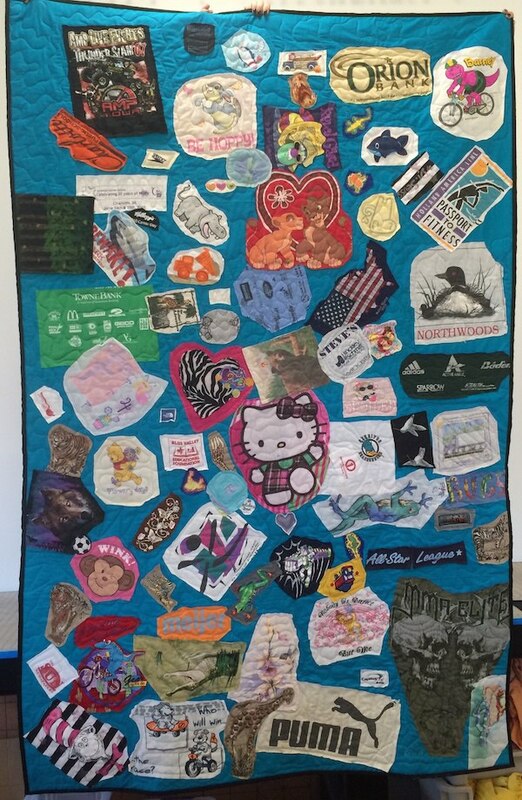 A memorial quilt is a great way to preserve their memory. The top of the T-shirt in which you put your head through. Many T-shirts have designs up by the shoulders or unique necklines; often we will use these in a T-shirt quilt. Overall quilting is characterized by a single pattern repeated throughout the entire quilt. 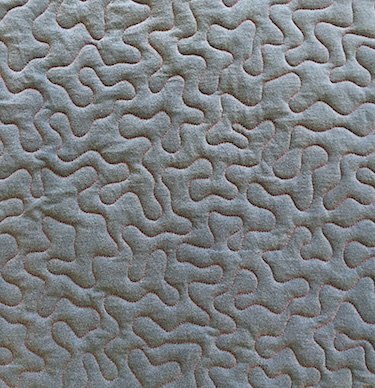 This is often the result of a computer driven long-arm quilting machine. A panograph quilting pattern uses the same repeating pattern throughout the quilt. The quilter, standing behind the long-arm machine, uses a laser pointer to follow a line pattern that set in the bed of the quilting machine. The quilter works from left to right and makes one pass at the design. The quilt is then forwarded and the quilter will make a second pass with the same design. T-shirts that are have been cut for a quilt or clothing alterations; we can still use them, though this is never preferred. A quilt is made up of three layers – the quilt top, the batting and the backing material. The quilt top is the base or top side of a quilt. It can be made up of one piece of fabric, but it is generally pieced from many pieces. 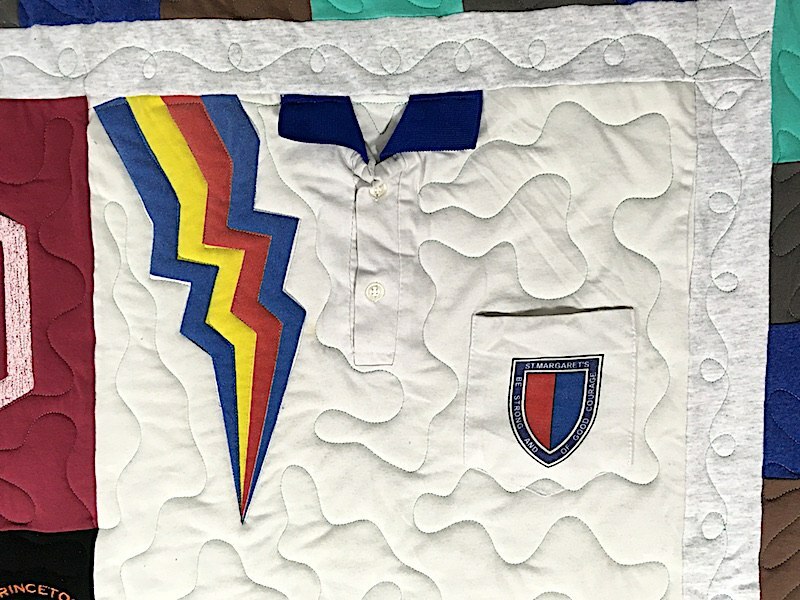 On a T-shirt quilt, the quilt top is made from T-shirts. Fabric dividing the rows and columns of a traditional block style quilt. 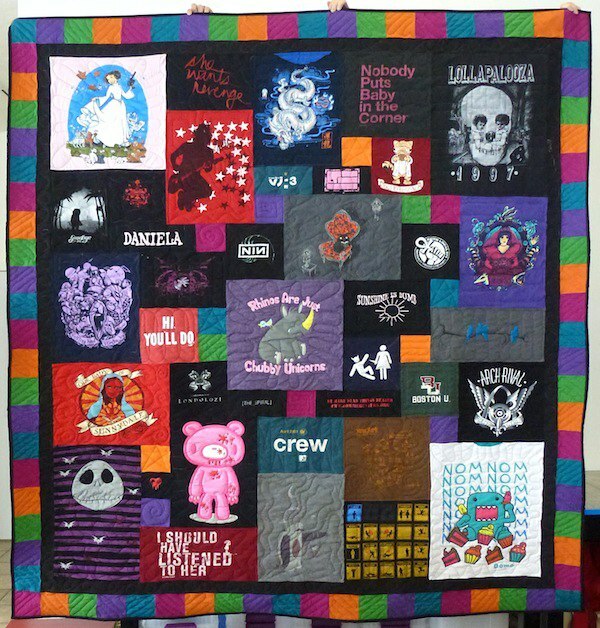 Below is a Google search of T-shirt quilts (the quilts in purple squares have sashing). A "sew down" refers to one piece of material that is sewn to another. For example: hats, socks, patches, or even pre-cuts would be classified as sew downs. Stippling is a meandering quilting pattern. In a true stipple, the stitching never crosses back upon itself. Some quilts are quilted entirely with a stipple design. Other quilters only use stippling in one or two blocks within a quilt. 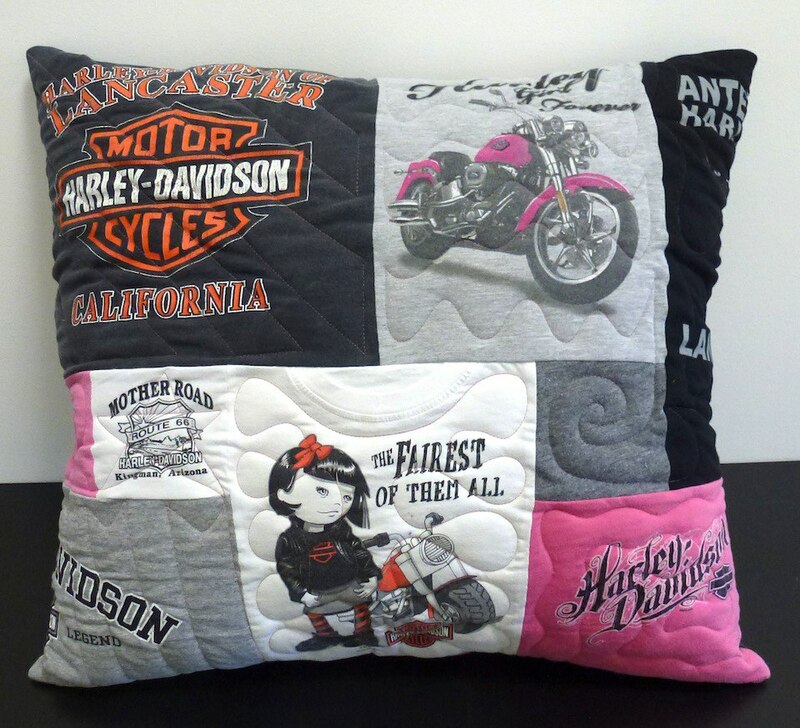 Like a T-shirt quilt, a T-shirt pillow is made with your very own T-shirts and stuffed with batting. Tech fabric is also known as microtech fabric. These are fabrics that are great at wicking sweat away from your body. Tech fabric is extremely soft and feels great to the touch. 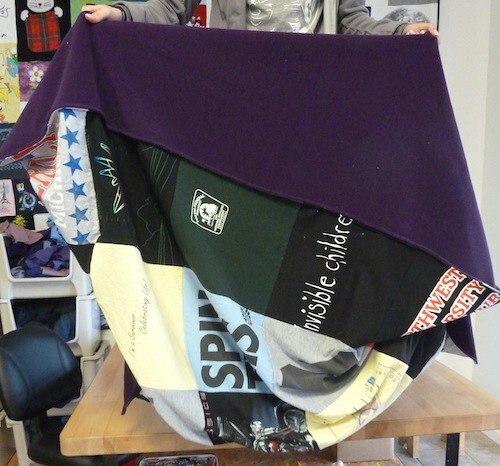 Tech fabric can be used in a T-shirt Quilt. 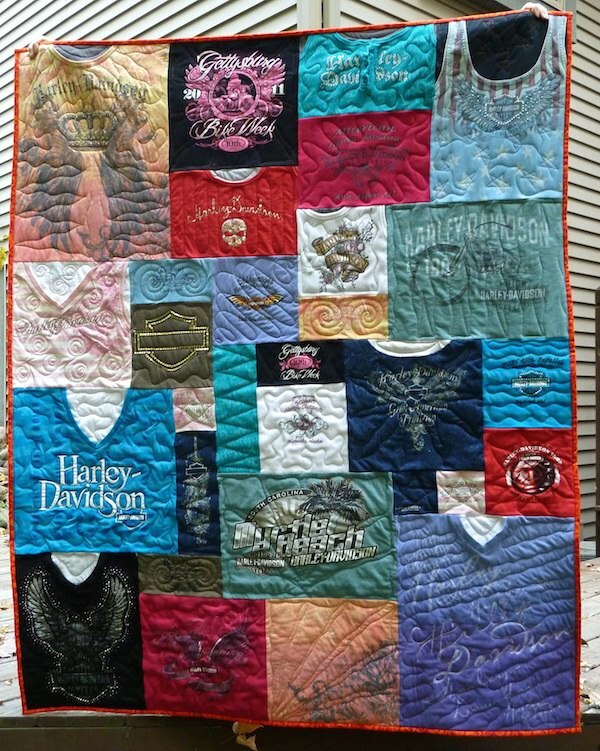 Theme T-shirt quilts are exactly what they sound like – a quilt made from T-shirts of a specific theme. Themes can range from a favorite sports teams to fictional character, from places to holidays. Thread is a very thin type of yarn used to sew and stitch fabrics together. There are many different color, material, and qualities of thread. Tracing is done with a long-arm machine. 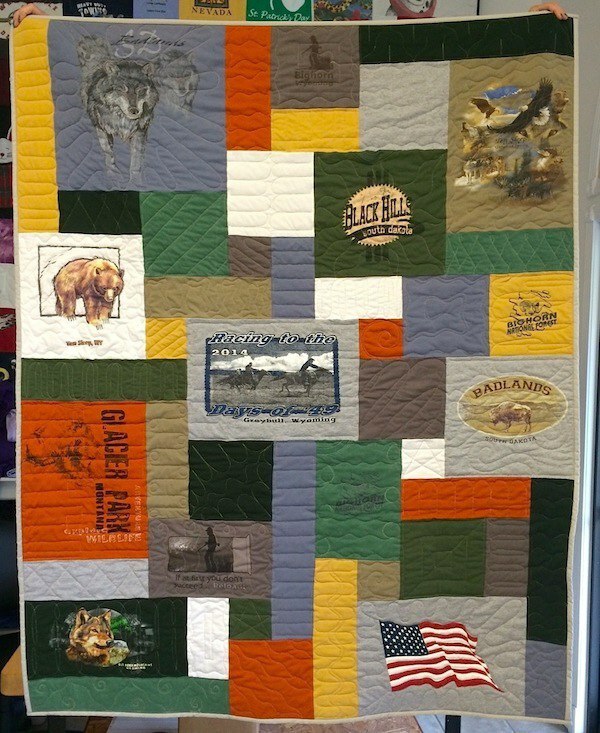 The long-arm quilting artist will trace a design on a T-shirt on the front side of the quilt. You can see the tracing on the back of the quilt as a mirror image of the design on the front T-shirt. 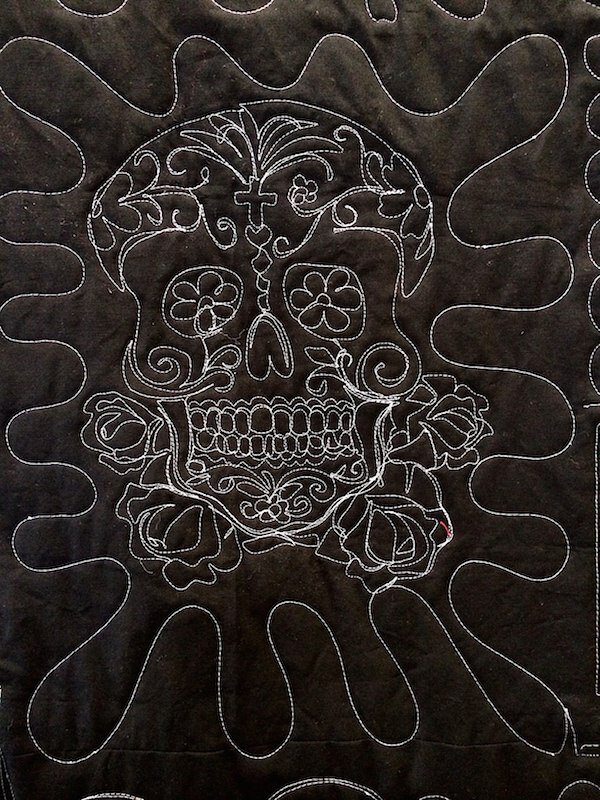 Tracing a number of items on a quilt makes the back of the quilt look as cool as the front! 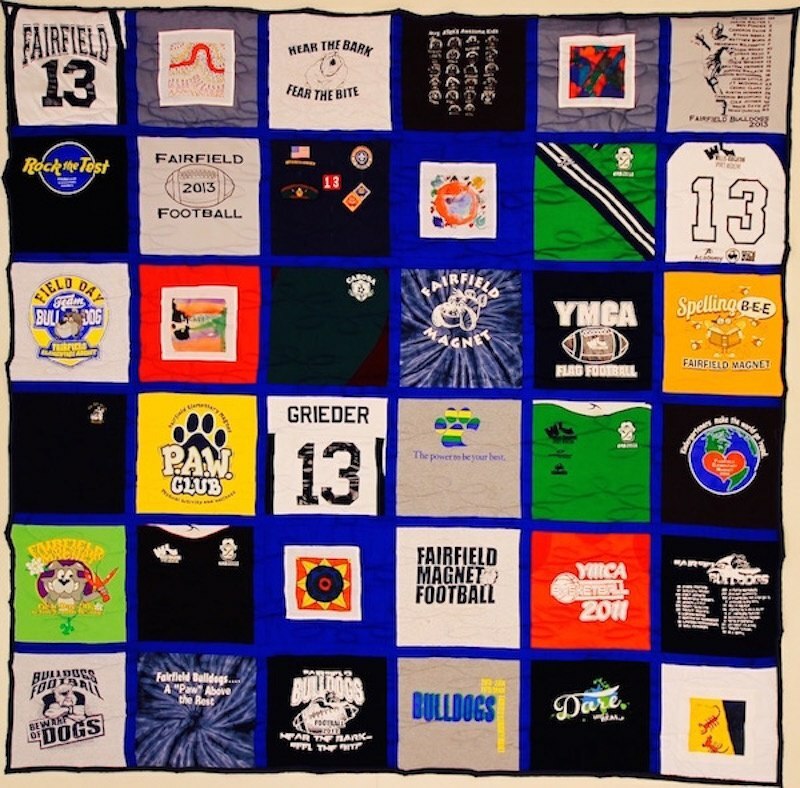 A traditional style T-shirt quilt is comprised of uniform sized blocks that are lined up in rows and columns. The rows and columns can be sewn directly to each other or separated with sashing. Every Too Cool T-shirt Quilt® has its very own box. When your T-shirts arrive, they are cut and then put into a plastic box with your name on it. Until your quilt is finished, this box will include everything associated with your quilt.